Wow, since the last time I wrote many things have happened. 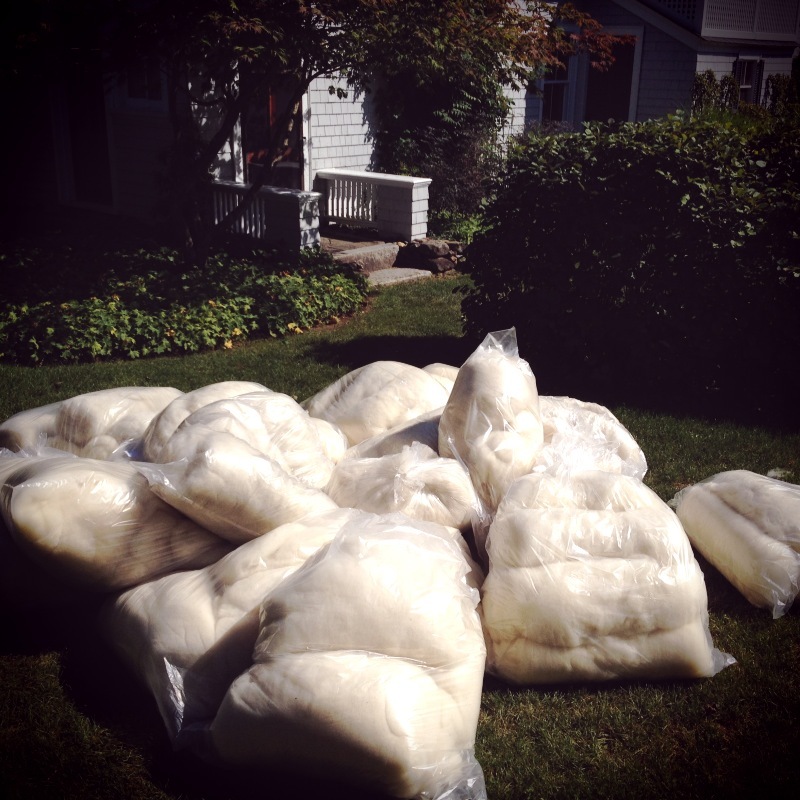 It’s been 18 months and just this weekend, while in NH for Labor Day, I went and picked up the last of the clean wool from the Fiber Dreams Mill. It’s amazing, and daunting. Over the last 2.75 YEARS, Jennifer has been faithfully cleaning the Icelandic and commercial Dorset wool I brought her. There were set back with a slight moth occupancy and of course, my wool was only some of the work that Jennifer was doing over this time period. But, at last, it’s clean, beautiful and ready to get Yurty. Also, my brother had a baby, Jack, who I dubbed Yurt Baby this weekend after throwing him in the pile of clean wool. 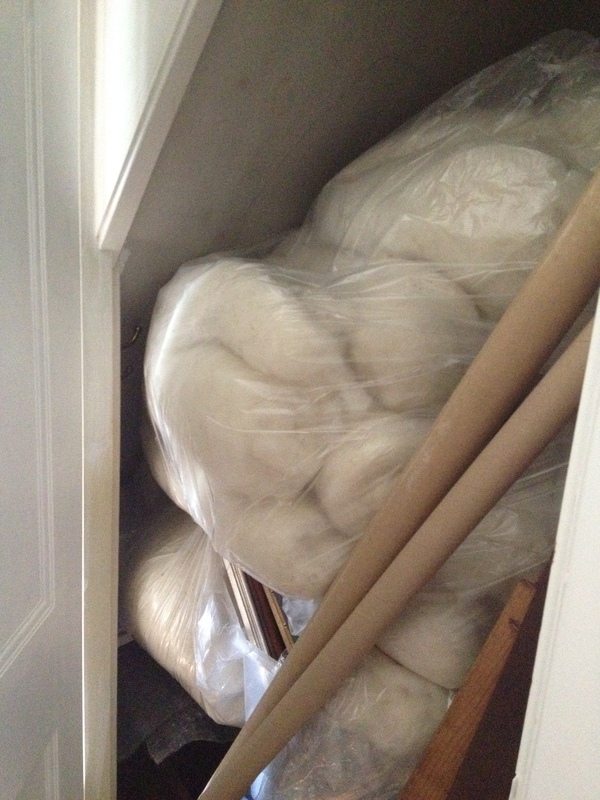 As my parents have been picking up a lot of the wool in installments, it has come to live in many of the far corners of our NH house. It has to be kept out of the way of prying mice and moths and not underfoot of my folks either. This is doable but when I went to organize it all in one place this weekend I discovered bags of batts in basically every closet, as per the above picture. Ultimately I got a bunch of it out of the house, but not nearly all of it. It’s so hidden that now I’d have to move furniture to get it out and that seemed a bit much for a photo opp. But hopefully the below photo gives everyone a sense of scale. I’m all settled up with Jennifer (Thanks to all my Kickstarters) and I’m now trying to figure out the timing to get this going. I can’t start until I have the time to finish since I want to work with all of the felted cording while it’s still a bit damp….so I’m thinking next Summer I can plan for a month of straight felting and make this yurt dream a reality. Who’s with me? Ahhh, anyway, it’s great to feel like there is progress again on this, I was starting to have self-doubt but I feel great now! This entry was posted on Tuesday, September 4th, 2012 at 1:21 pm and is filed under Material. You can feed this entry. You can leave a response, or trackback from your own site.